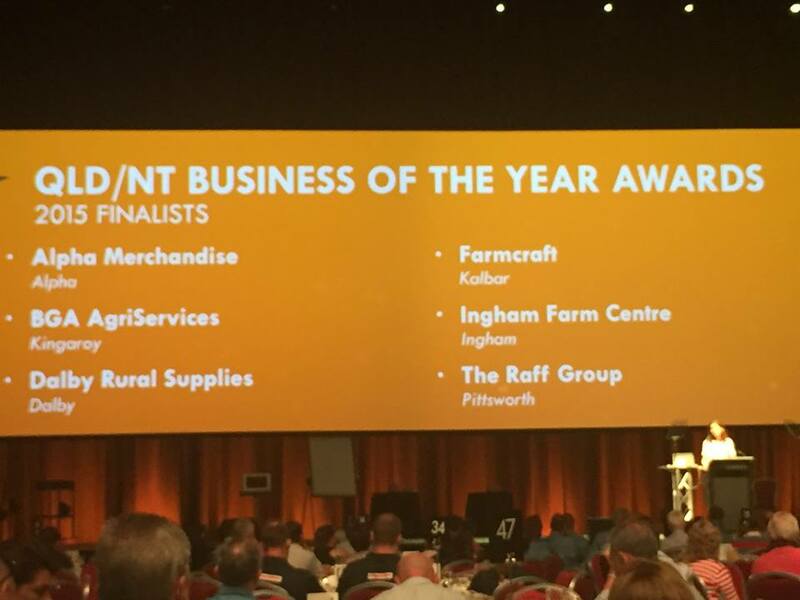 Dalby Rural Supplies has again been named the 'Queensland & Northern Territory CRT Business of the Year for 2017' at the CRT National Conference held in Perth in February 2018! After taking out the national title last year, our team are thrilled to have had another stellar year, securing the Queensland title again. “Their achievements over the year simply couldn’t be overlooked. The level of professionalism, outstanding culture and high level of service delivered by the team at Dalby Rural Supplies makes them an excellent business and sets a fantastic example for other businesses across the CRT network,” said Greg O’Neil, Executive General Manager of CRT on behalf of Ruralco Holdings Limited. CRT Queensland State Manager, Sharon Dew, couldn’t speak highly enough of the team at Dalby Rural Supplies. “John and the team are relentless in their pursuit of success not just for the business but for their clients and community. To deliver the best service each day requires a huge amount of dedication and commitment and the team at Dalby Rural have demonstrated this over a number of years, reflected in their continual success,” said Ms. Dew. John Cullen, Director of Dalby Rural Supplies, explained the award was a great way to recognise the hard work put in by his team throughout the year. “To compete with such a huge number of highly successful businesses across Queensland and to come out on top is a great honour. We challenged ourselves to continue to improve the quality of our offering to our clients after winning last year and this award shows we have continued our efforts throughout 2017. I am very proud of the team,” said Mr. Cullen. After enjoying success for the last few years, the team have already been hard at work in 2018, ensuring they are serving their community to the best of their ability. “The awards are great but the true measure of our success is being able to satisfy our clients’ needs and helping them succeed in everything they do,” concluded Mr. Cullen. We would also like to congratulate our fellow CRT FarmFest store Farmcraft, for being awarded 'Community Member of the Year for 2017'. Great work FarmFest team! And the winner is... DALBY RURAL SUPPLIES! John Cullen attended the 2017 National CRT Conference in Melbourne last week where we were thrilled to win the 'CRT Business of the Year for QLD/NT Award for 2016' as well as setting a CRT record; receiving the coveted 'CRT National Business of the Year Award'! This makes us the first business to win the national title three times! With over 300 stores, CRT is Australia's largest group of independent rural retailers. It is an incredible honour for Dalby Rural Supplies to be recognised not only as the top of the state, but nationally as well. We would never have achieved this without the support of our clients, our hardworking staff and our involvement in the local community. "Being recognised for the way we have serviced the Dalby region over many years is humbling, but it has been our privilege to work with the people within our district," John said. The CRT Conference was an exceptional event keeping members from across the country thoroughly entertained with a trip to Luna Park, a fantastic array of speakers including former Prime Minister John Howard, as well as a supplier tradeshow. The tradeshow was a great opportunity for us to view the new technology our suppliers have on offer, and test out programs that are still in their prototype stages. We are excited to see where these innovations will take us in the future. The 2016 CRT National Conference was held on the 11-14th February 2016 at the Gold Coast, with the annual Gala Dinner Awards Ceremony announcing the 2015 CRT business awards. We are proud to announce that we were a finalist in the 'QLD CRT Business of the Year Awards'! 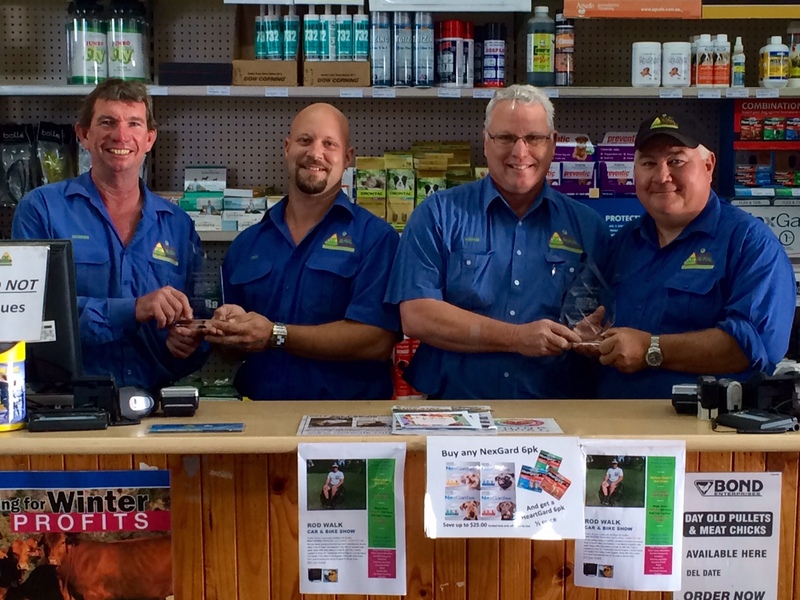 We would like to congratulate Farmcraft CRT Rural Stores on their achievement winning the 2015 award for Queensland! Congratulations to all other CRT stores who achieved awards within their state; Western Australia - Mullewa Rural Supplies, New South Wales - Taree and Wingham Produce, South Australia - Complete Ag & Seed Supplies and the National CRT Business of the Year - Hewitt and Whitty CRT Ballarat. These CRT awards recognise professionalism, commitment to local communities and support for staff, suppliers and fellow CRT members. We are still feeling extremely chuffed about our achievements at the Dalby Business Excellence Awards evening in October 2015! Being awarded the 'People's Choice' and 'Judge's Choice' awards for the Agricultural Services industry allows us the opportunity to benchmark ourselves against our peers within the Agricultural industry. This achievement gives us more confidence and motivation to work even harder for our customers and our community and we hope this inspires others to strive for excellence in their businesses as well. We would like to thank Dalby Chamber of Commerce for organising such a brilliant evening and the sponsors for their contributions and involvement. We owe our success to our amazing customers for their continuous support, our dedicated staff for their hard work and our suppliers for their support. We would also like to congratulate BMO for winning 'Large Business of the Year' and Adam Luck Electrical for winning 'Small Business of the Year'. 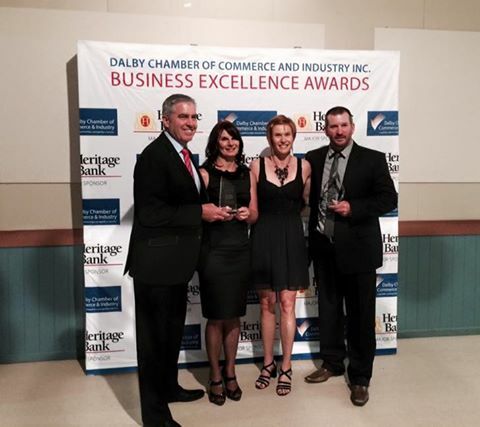 For more information about the Dalby Business Excellence Awards visit the Dalby Chamber of Commerce website. 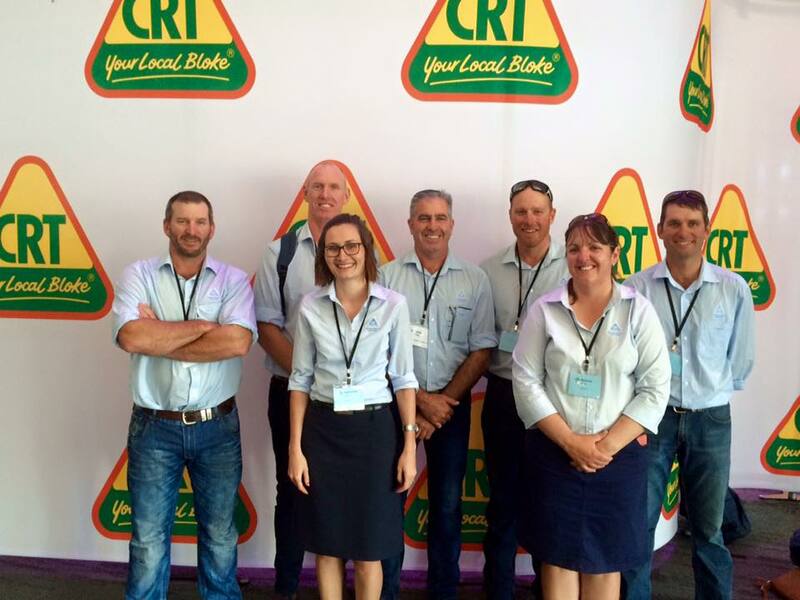 Dalby Rural Supplies were honoured for their strong customer service and commitment to the community at the CRT National Conference in Adelaide in February 2015. 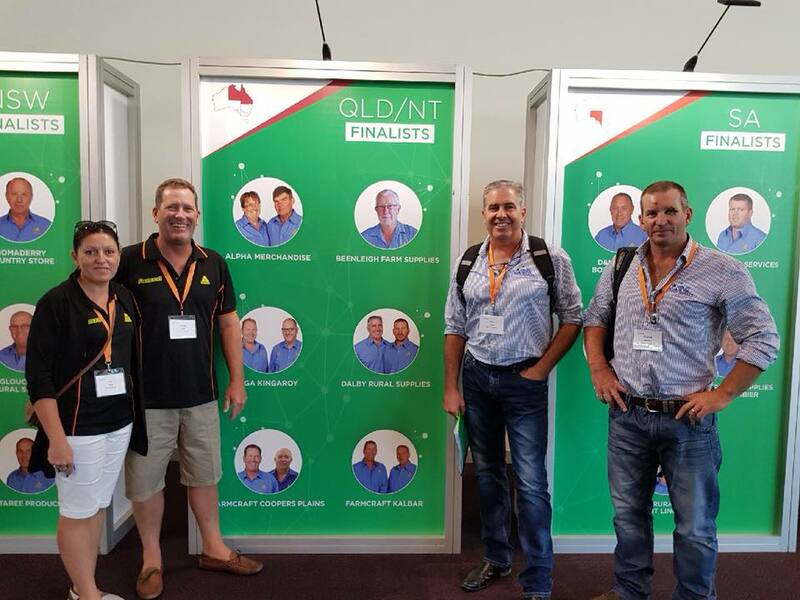 The experienced team were one of six finalists for the 'CRT QLD/NT Business of the Year Award for 2014' at the Gala Awards dinner held at the Adelaide Convention Centre. This award recognises the professional characteristics of a strong support for staff, formidable partnership with suppliers, networking alliances with fellow CRT ‘Local Blokes’ and stores, and a beneficial commitment to the community. The 2014 award went to Farmcraft, Kalbar. James Nott, CRT NSW/QLD State Manager, said the nomination was well deserved. “CRT is very proud of its association with Dalby Rural. They are clearly the dominant rural merchandise business in their market, built by their professionalism, service standards and community support,’’ Mr O’Neil said. 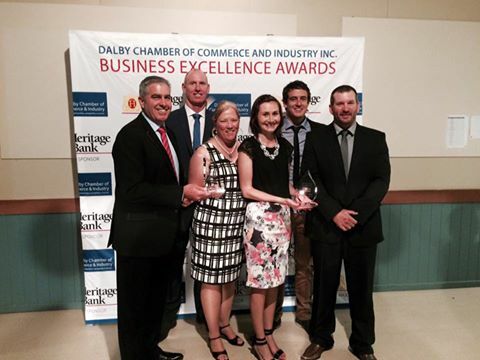 Each year the Dalby Chamber of Commerce conducts a Business Excellence Awards event which aims to highlight local businesses who are nominated by the general public and who then successfully complete a stringent application process. We were delighted to receive a Silver award and also the People and Success & Sustainability criteria awards at the 2014 Business Excellence Awards dinner on Saturday 18th October! Thankyou to our loyal customers for nominating us to receive an award and for supporting us every day! We would also like to congratulate all local businesses who received awards, particularly Ashtons Butchery for receiving the Small Business of the Year award and Dalby Engine Rebuilders for receiving the Large Business of the Year award. For more information about the awards process visit the Dalby Chamber of Commerce website. 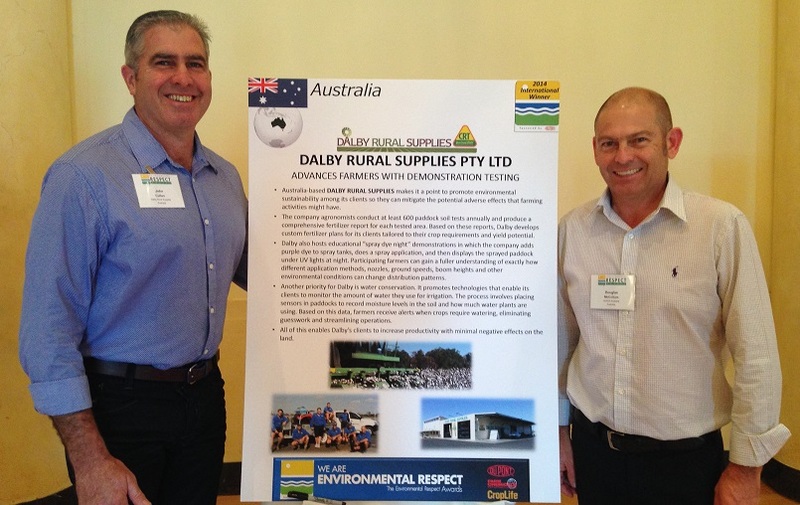 Dalby Rural Supplies joined the ranks of agriculture’s top environmental stewards when it received an international Environmental Respect Award in September 2014. The Environmental Respect Awards are the agricultural industry’s highest recognition for environmental stewardship among agricultural retailers, those who serve farmers with the nutrients, pest control and agronomic information critical to effective crop production. Dalby Rural Supplies is the first business from Australia to receive an Environmental Respect Award. For 24 years, DuPont Crop Protection, CropLife® and Farm Chemicals International® magazines have sponsored the Environmental Respect Awards in a continuing effort to honour farm supply businesses that preserve and protect the environment in the course of their service to farmer-customers. The program seeks to recognize good stewards, encourage stewardship among other agricultural businesses and disseminate information that provides managers with ideas on improving their operations. John and Katrina Cullen of Dalby Rural Supplies travelled to Wilmington, Delaware during July to accept their award from Rik Miller, President of DuPont Crop Protection. Celebration activities included visits to Chesapeake Farms, Willard Agri-Services, Stine-Haskell Research Centre and the Hagley Museum. Mr Cullen says that the Environmental Respect Awards provided a unique learning experience. “It was such a great opportunity to meet, network and share experiences with other like-minded agricultural businesses from across the globe.” said Mr Cullen. “Through our involvement in this program, we have learnt a great deal and we have been able to improve our business as a result. I hope that many other retailers take the opportunity to get involved in the future so that they can share in the benefits that we have gained.” Good stewardship practices are not just good for the environment; they make good business sense as well. Farming is a long term investment and it is important that we manage the assets at our disposal wisely and with this in mind. The Environmental Respect Awards have been operating for 24 years and will be honouring agricultural retailers again in 2015. It is simple to apply with an online process to conduct a self-audit of your business. There are questions about your facility, commitment to environmental stewardship, safety, security and material handling and storage. More information about the award is available by visiting Environmental Respect or please contact John Cullen, 07 4660 0400 or Doug McCollum, 0427 270 708. Please feel free to view the related article published in the July issue of Rural Business magazine. View further information about Dalby Rural Supplies and the 2014 Environmental Respect Award ceremony. 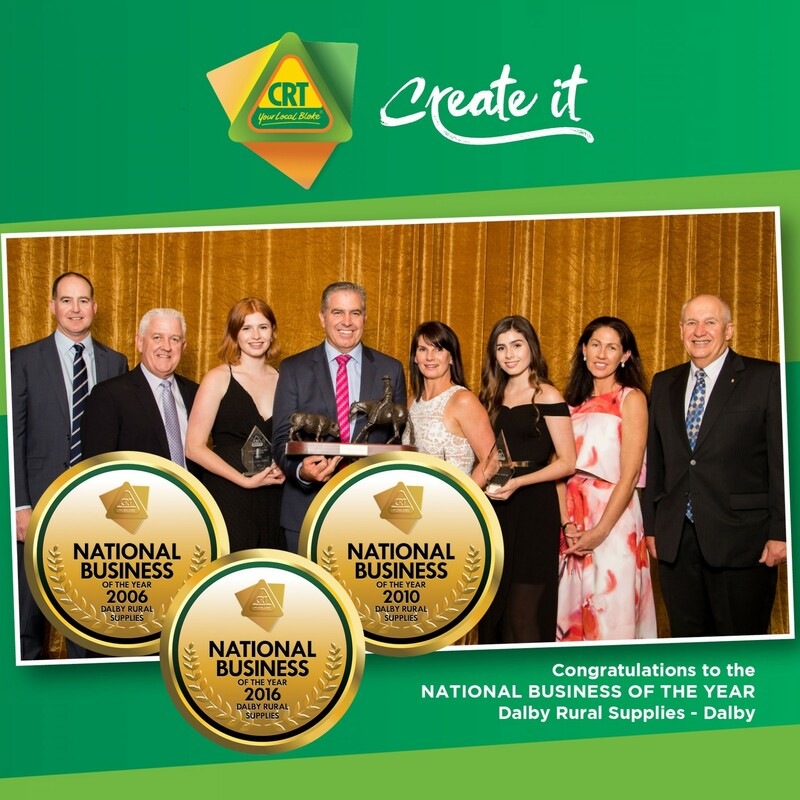 Dalby Rural Supplies has proudly taken out 'CRT’s 2013 Queensland Retailer of the Year' award at the CRT Supplier Awards Dinner held on the 14th February 2014 during the CRT National Conference in Melbourne. The awards acknowledge the commitment and expertise shown by its 300 independent rural retailers across Australia and New Zealand. There to receive the award on the night was one of the partners Andrew Johnston, with his wife Ruth.